Organic Gardening 101 With Ben’s Dad, John Algiere! 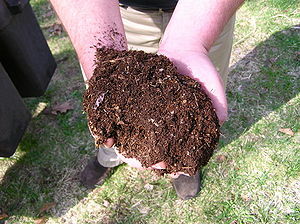 Compost, the key to a healthy organic garden. Last week we talked about Ben’s favorite fertilizer and deer deterrent, Milorganite, which is 100% organic and composed or recycled material. It made us wonder, where did Ben get his start with organic gardening? Our question led us, just in time for Father’s Day, to sit down and have a little chat with Ben’s dad, John Algiere, one of the first organic gardeners in the area. When asked how Ben got his start with going green, John said that both Ben and his sister Kate started early, around 3 or 4 years of age. John’s best advice is to teach kids when they’re young, show them how to separate garbage from compost, putting the apple peels and coffee grounds in one container, the wood, paper, and metals in another. Kids can also help with pest control, hand picking the potato beetles off of plants and working to keep the soil insect free. Handpicking takes a lot of work and is time consuming, but is worth the effort. For those who want an extra hand, John recommends organic insecticides; particularly anything which contains BT. He also says you can make your own insecticide using hot pepper, soap and water. For larger pests, John says there’s a fallacy that composting will attract rodents to your garden. Not so, if you stay away from using meat, bread, or anything that will attracts rats or mice. To be an organic gardener, you have to be part chemist, using just the right combination of brown and green materials, air, and moisture. It takes patience and experimentation to get just the right mix for your soil. John warns that not everything in an organic garden is going to be perfect; you won’t be able to catch every bug and prevent every blemish. But the benefit to your health and that of the environment is well worth the extra time and attention. This entry was posted in Uncategorized and tagged Ben, Compost, composting, dad, Dads, DIY, Father, Fathers, Garden, gardening for kids, gardens, going green, growing up, Home, Home garden, Milorganite, organic, Organic horticulture, pest control, recycling, Soil on June 14, 2012 by mspetersonexplains.